Managing a career as an “art quilter” with some “modern” thrown in is what Cheryl Sleboda does when she’s not occupied with her regular job of teaching stores about the comic book industry. She grew up on the south side of Chicago, in the Beverly neighborhood, where she attended Bremen High School and South Suburban Community College. A theater major, she soon developed an interest in costuming, although no one in her family sewed. Then there was a move to Baltimore, where she discovered the world of quilting in 1997 when she happened to stop at a Jo-Ann Fabrics store for something else, and unexpectedly left with a stack of pre-cut, blue and white blocks-of-the-month, all ready to sew. She has yet to finish the quilt, which she is slowly hand-quilting (not a favorite technique of hers). 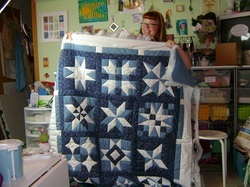 She made a lot of baby quilts at first, giving her a jump-start at quilting. Gradually she began to see new ways to make her own designs and machine quilt them, inspired by ideas, photos, or even new quilting gadgets. She also enjoys fabric manipulation – smocking, folding, pleating, or scrunching – for an original look. Two of the quilters whose work she admires are Susan Brubaker Knapp (www.bluemoonriver.com) and Karen McTavish (mctavishquilting.com). Cheryl has three favorites among her quilts. Geschwindigkeit (“Speed” in German) is her rendering of a photo she took of her hand turning the key in the ignition so she could always recall the purchase of her ’73 Mustang. It won an award at the 2014 Quiltfest in Savannah, Georgia. Road to Home is a representation of the City of Chicago, celebrating her return from Baltimore, another award winner. A final favorite is her electrified/lighted quilt, and Shattered, which has attracted much interest in art quilt circles and reflects her desire to see old techniques made new. When she’s stymied by a project, she heads for the Internet, where her favorite quilting sites are www.quiltingdaily.com and https://generationqmagazine.com/. She’d also like to try www.spoonflower.com where she can print her own fabric. Drawn to Riverwalk in 2008 after her return from Baltmore, she appreciates the meetings focused on modern quilting and hopes to see more programs about free motion quilting. Cheryl has served as both programs chair and president. See her website at muppin.com/wordpress/.